This design is amazing! It's our newest wood member and we just love that the friendly forrest is printed on the wood its the perfect matching! If you have a wedding venue that is surrounded by trees than this is the perfect wedding invitation. It's so stunning to see the natural timber fibres poking through the trees. So much to love about this invite. Printed on a thin sheet of mahogany wood these invites have beyond the wow factor! There is no way every one of your guests will comment when they get this beauty. The wood is such an usual material we just love it as a wedding invite to stand out of the crowd and it really suits the rustic charm with a touch of glam that is so on trend at the moment. So we often get asked about the thickness - it's 0.45mm thick and the wood cost the same amount to send as paper would :) It's incredibly durable and we just love the grains and colour of the mahogany as seen here, it's nothing short of divine. So cute seeing the branches leaning in to your names, the bold fonts literally parting the trees, it has a really warm feeling, we hope you agree. And.... the best news is that this wedding invitation is so eco-friendly! We are so happy to tell you that the amazing printers we use for these guys are truly one sustainable little set up. They tell us that their timbers are naturally better for the environment than paper. They use less waste, chemicals and emissions - and the best part?! Even though your invitation order will only be using a small fraction of the tree - they replant a full tree for you! Thats a full tree, we think they are amazing and so happy to be working with them. We just love that not only do these invitations look SO, SO amazing and unusual, but by ordering them, you get a tree planted. There is so much to love about our printed on wood invites. To feel the grain, and the textures, these wedding invitations need to be held to be fully appreciated just how magical they are. We highly suggest ordering a sample for $5. We can match the envelopes with a matching kraft, earthy brown envelope as well if you prefer. These designs are brand new to lilykiss - so rsvp cards, placecards and wishing wells and all matching items do all exist in this design - please get in touch if you'd like a pic, up online soon! We hope you love these darling forrest designs as much as we do :) Claire and The Lilykiss Team x *Please note, the mahogany wood is so pretty, but given the nature of the material, being wood! The colour might vary slightly for your actual order from the sample you receive. It will still of course be mahogany wood, but we can't guarantee the colour of each tree, they will be similar but some have a little more pink undertones and some a little more yellow - however they are all just divine. 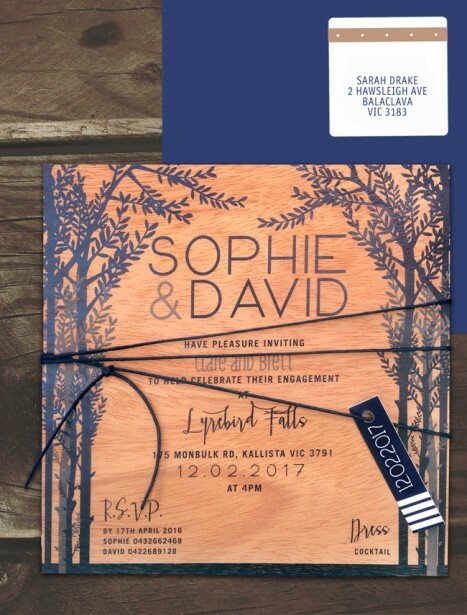 Part of the beauty of woking with a natural material is that each of your invites will be different and unique. Also note that the wood comes in 2 thicknesses a thicker is available on request. As well we are busily getting up matching rsvp cards, placecards, save the date cards and menus and all other matching stationery items in this wedding invitation design! They look amazing as a set please ask us for images if you are interested as we just haven't had time to get them up as yet! Soon!